This is the latest post in a series analyzing Arkansas traffic fatalities. 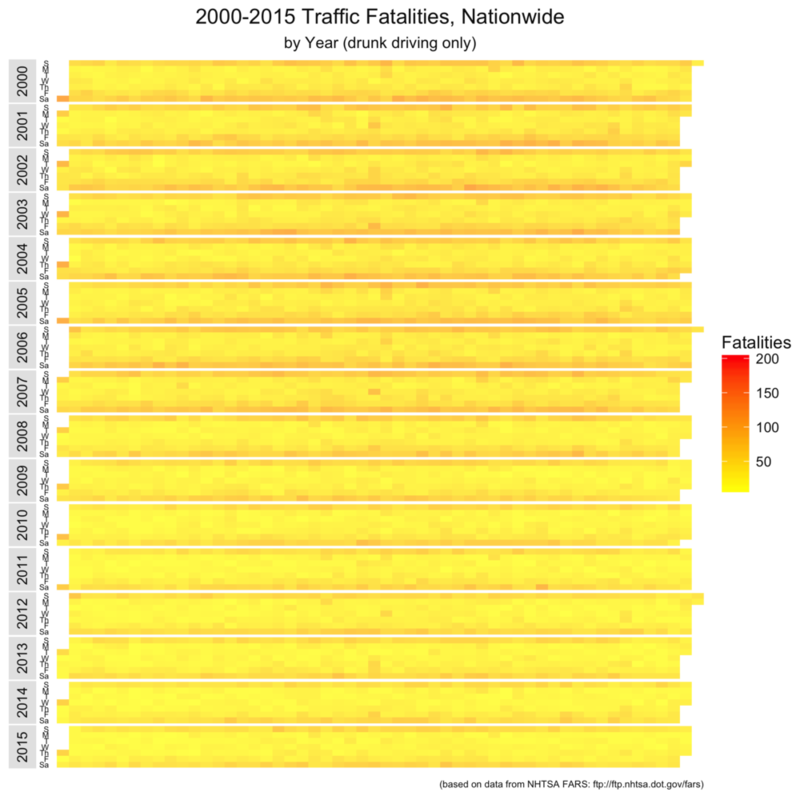 Please take a look at parts 1 (a map of 2015 traffic deaths), 2 (heat maps of fatalities by day from 2000-2015), and 3 (heat maps of fatalities by day of week from 2000-2015) if you haven’t already. Today’s post is probably my favorite of this series. It piggybacks off parts 2 and 3, in that we further explore the relationship of the time of day to traffic fatalities. The first set of visualizations maps the raw number of traffic fatalities in the US by the time of day. You can click to zoom the image. 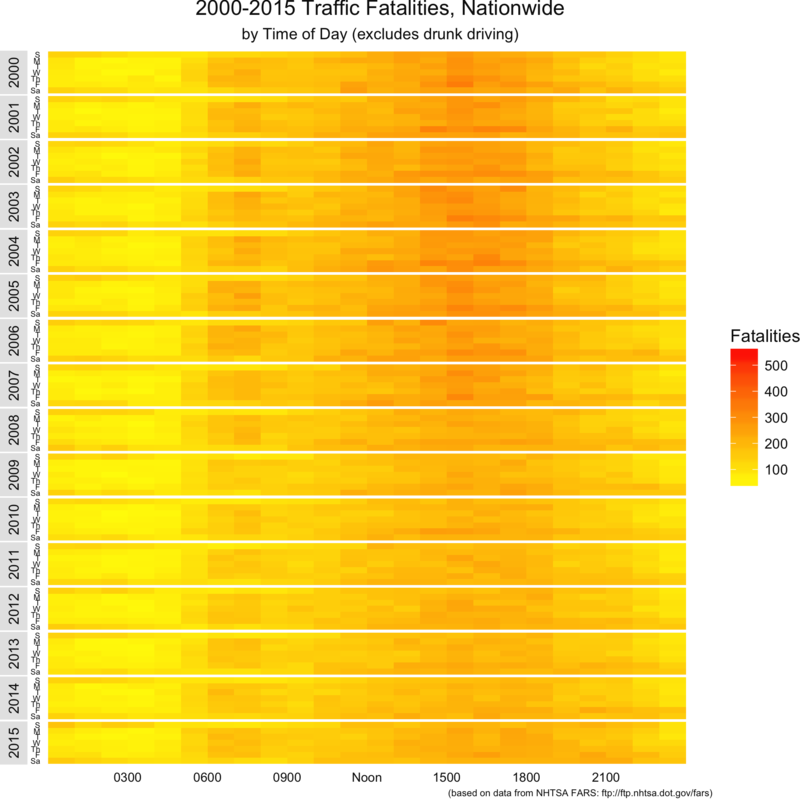 Each horizontal band represents year between 2000 and 2015. Each row within the band is a day of the week, and each vertical column represents an hour of the day. From left to right (or top to bottom on small devices), you have drunk driving fatalities, non-drunk driving fatalities, and total fatalities. In this set of visualizations, we can clearly see two things. First, weekend evenings are very hazardous for drunk drivers. Second, we can see two distinct bands for morning and afternoon commutes for non-drunk-driving fatalities. As I have with the earlier posts, I repeated the same analysis on Arkansas-specific wreck information. Again, the same trends appear to hold, although the bands aren’t as smoothly colored (that tells us the data is a little noiser due to fewer data points). Note that this scale is different than the nationwide set. We’ll be using the same FARS data we used in the previous two posts. Let’s set up our libraries, import the data into R, and get moving. For a more detailed explanation of what we’re doing here, please refer to part 2. Now, we need to clean the time of day data, as sometimes the midnight hour was entered as 0; other times as 24; and still other entries contained junk values like 99. As we did with the other visualizations, we’ll need to add some date columns to determine the day of week and year. Next, we’ll summarize the data by drunk/not drunk/all. Let’s set our max and min so that we can use the same scale across all three plots. 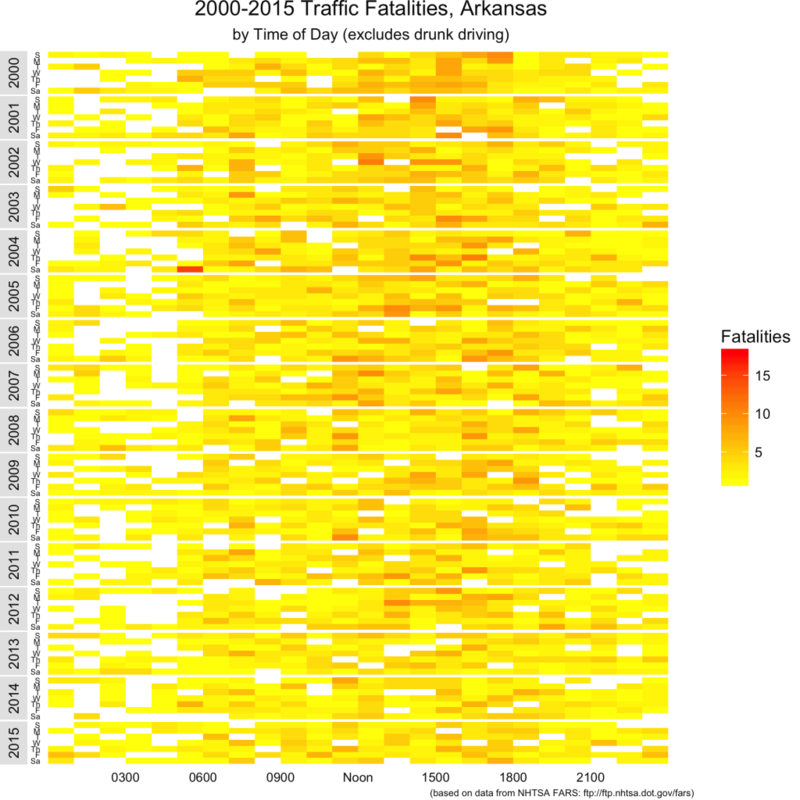 Next, we’ll factor the days of week into human-readable format for each of the three data sets. Finally, we’re done wrangling the data. Let’s define a theme for the plots that’s consistent with the previous two posts. Now, we’ll simply plot each of the three datasets and save the results. I said at the beginning that this was probably my favorite of the three sets of visualizations. 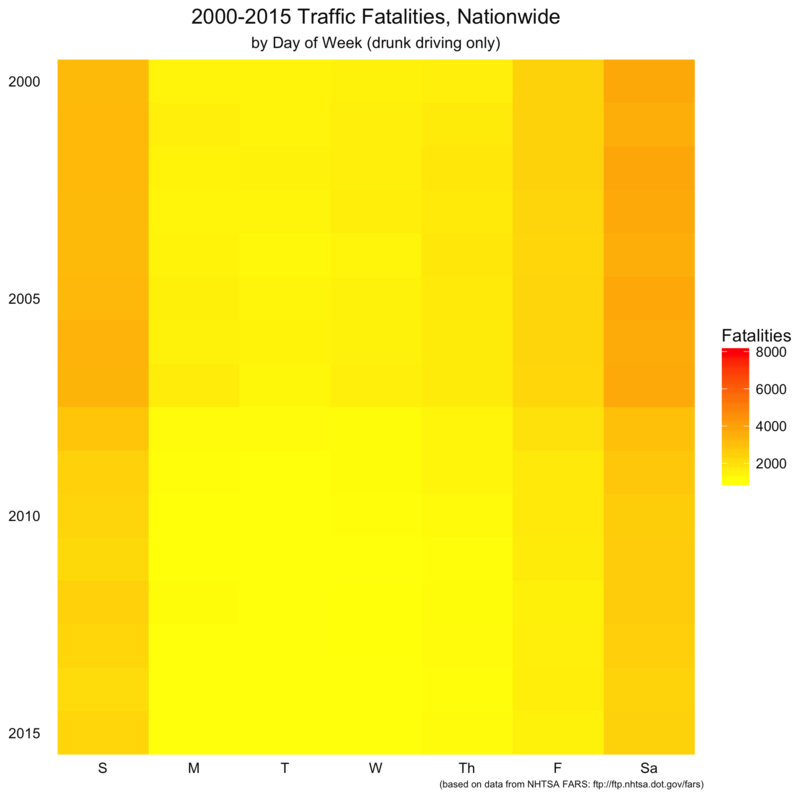 Do you agree with me that this set of visualizations is the most informative about when traffic fatalities occur? Edit 7/29/17: I noticed the title of the Arkansas images erroneously said Nationwide. I corrected this mistake. 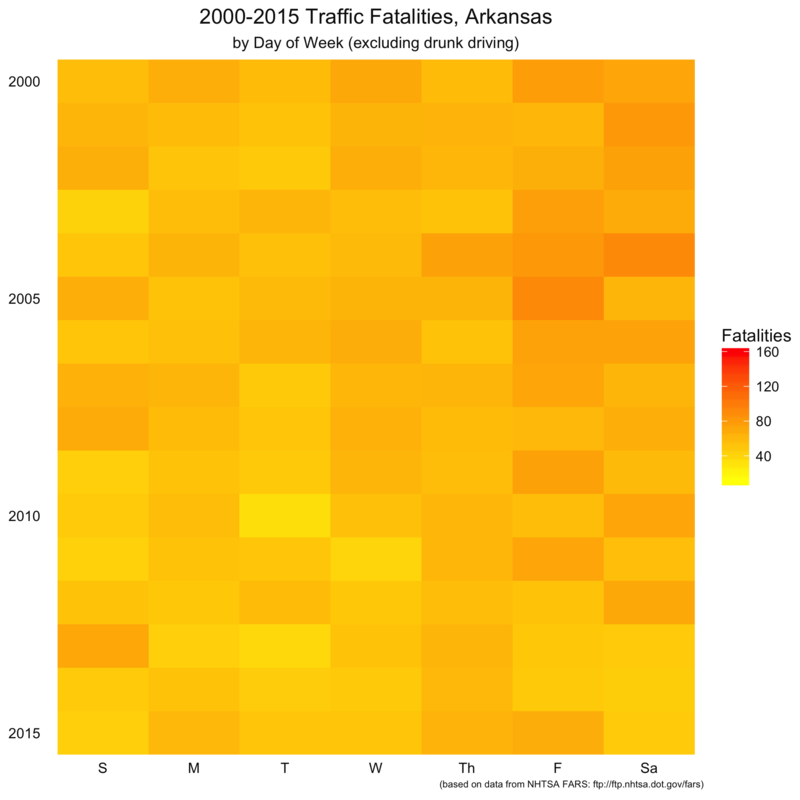 This is the latest post in a series analyzing Arkansas traffic fatalities. Please take a look at part 1 (a map of 2015 traffic deaths) and part 2 (a heat map of all fatalities, both nationwide and in Arkansas, from 200-2015) if you haven’t already. 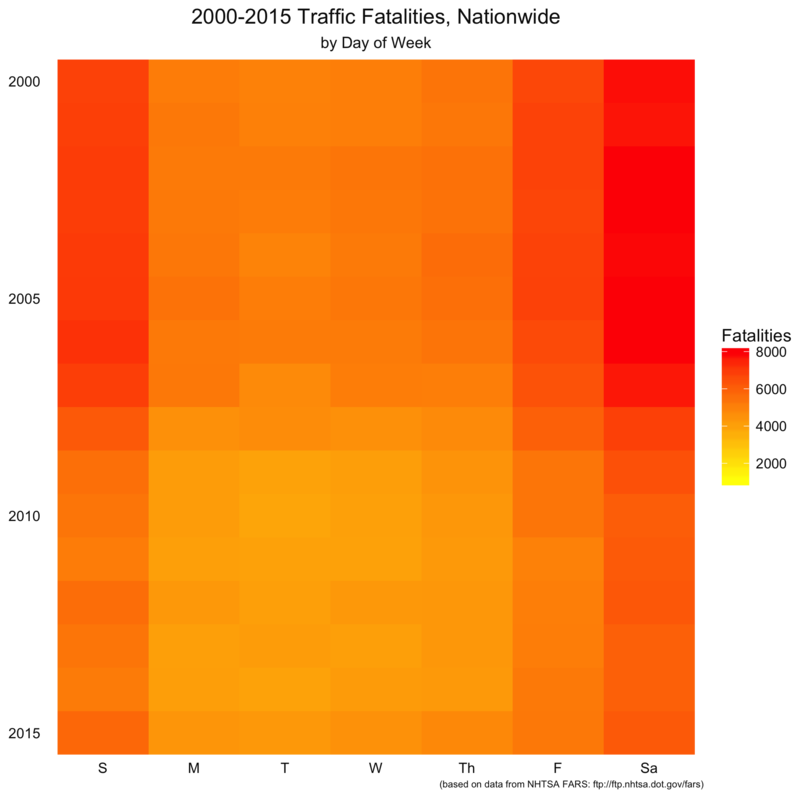 Today’s visualization piggybacks off part 2, in that we further explore the relationship of the day of the week to traffic fatalities, both nationwide and in Arkansas. The first set of visualizations maps the raw number of traffic fatalities in the US by the day of the week. You can click to zoom the image. 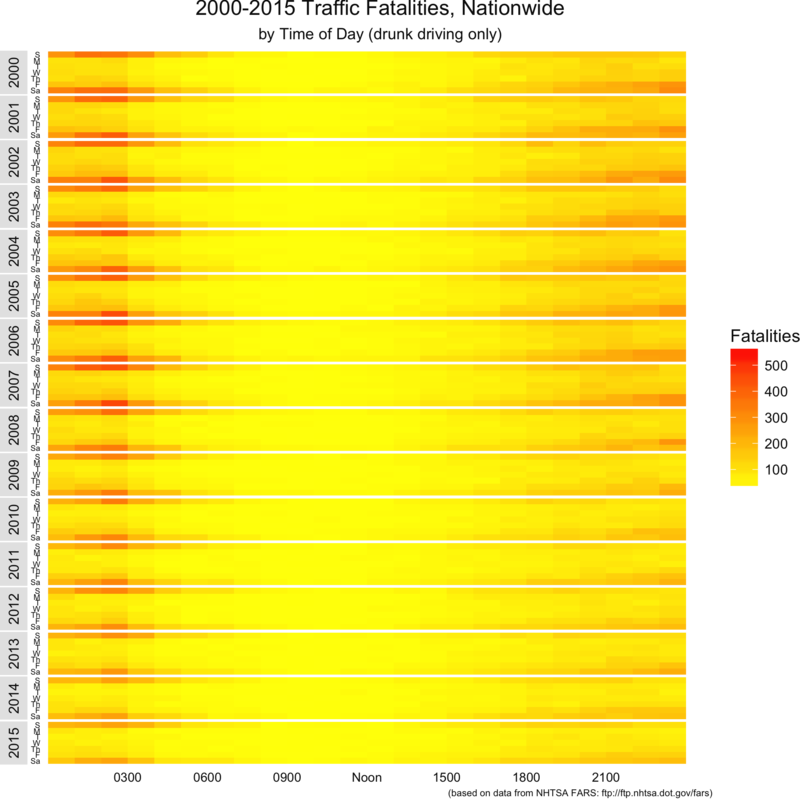 Each band represents a single year between 2000 and 2015. Each row within the band is a year, and the column represents the band. From left to right (or top to bottom on small devices), you have drunk driving fatalities, non-drunk driving fatalities, and total fatalities. There are a couple of things that stand out here. As we saw in the previous post, weekends are far higher for drunk driving fatalities than during the week. A couple of things we couldn’t easily see in the previous post is that non-drunk-driving fatalities are pretty evenly spread throughout the week. Finally, moving from top to bottom in the charts, it looks like traffic fatalities may have gone down somewhat over the past 15 years. As I will with the remaining posts, I repeated the same analysis on Arkansas-specific wreck information. Again, the same trends appear to hold, although the bands aren’t as smoothly colored (that tells us the data is a little noiser due to fewer data points). Note that this scale is different than the nationwide set. Now, since this is a weekly analysis, we’ll add in some information about each date itself. This gives us the weekday and year (along with some other information we’re not using here), which will form the x- and y-axis for our visualizations. Next, we’ll aggregate the data by year and day of week we created in the previous step. We’ll also take the min and max so that we can use consistent scale colors across the three visualizations. The next step is a user-experience step of changing the day of the week from a number to a more-familiar text abbreviation. That’s it for data wrangling. Now, we just need to plot the data. Again, we’ll define a theme so that the charts look pretty and incorporate the same color scale. Next, we’ll define a data directory to save the output. Now, we’ll simply plot and save the output. We’ve seen using a couple of different metrics that drunk driving fatalities seem to occur more often on the weekend. In the next post, we’ll look at another set of heat maps that break down when driving fatalities occur during the week even further: by time of day. A couple of weeks ago, I posted a map of the traffic fatalities in Arkansas in 2015. The data came from the NHTSA, and the graphic I posted was just scratching the surface. I’ve sliced the data a couple of different ways and created three more sets of visualizations about that data. For the next three posts, I’ll show the visualizations, my interpretation, and then the code so that non-programmers will get the goods on the front end. 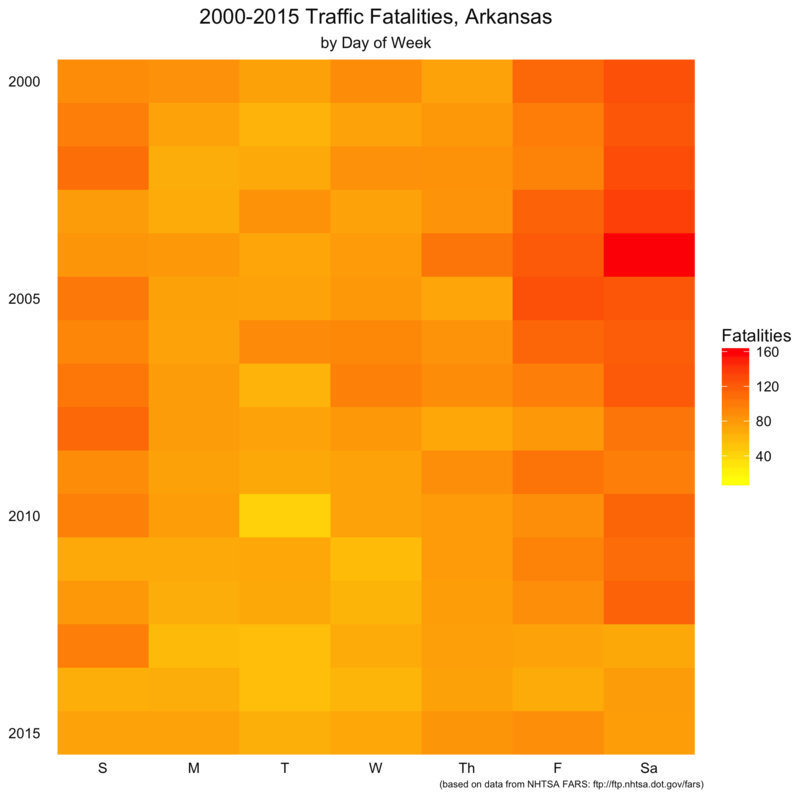 The first set of visualizations maps the raw number of traffic fatalities in the US. 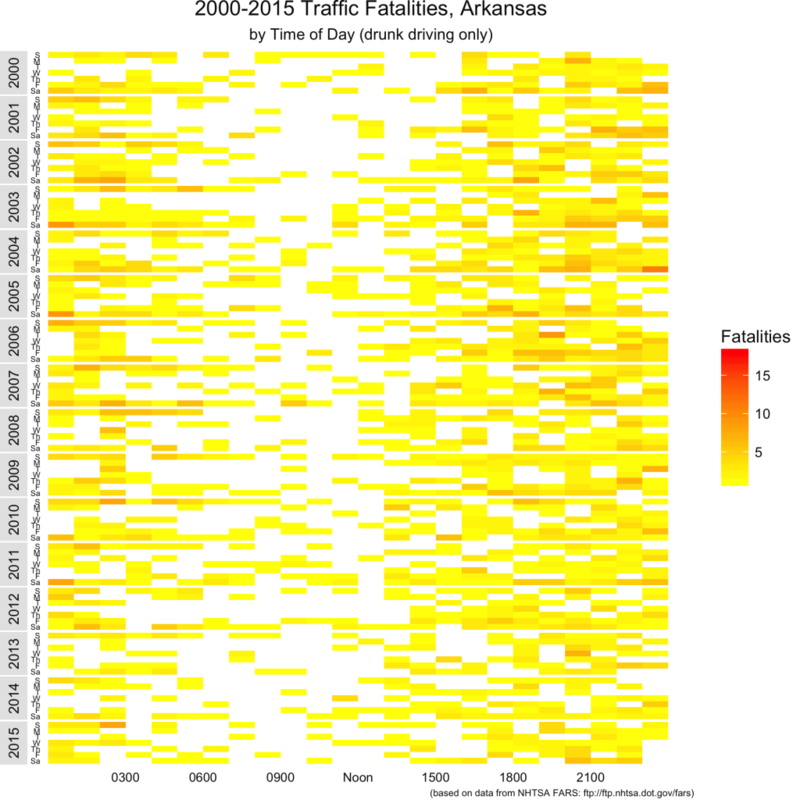 Each band represents a single year between 2000 and 2015. Each row within the band is a day of the week. From left to right (or top to bottom on small devices), you have drunk driving fatalities, non-drunk driving fatalities, and total fatalities. We’ll repeat this comparison a number of times, and the color coding in each set of graphs uses the same scale (so we compare apples to apples across the three visualizations). For me, there are two things that stand out in this set of visualizations. First, drunk driving fatalities are heavily weighted towards weekends. Second, New Years’ Day (the left- and top-most block) is an especially dangerous time to be in the road. As I will with the remaining posts, I repeated the same analysis on Arkansas-specific wreck information (this requires a single line of R code given below). The data is a little noisier, but the same results appear to hold. Note that this scale is different than the nationwide set. The scale is a little skewed towards lighter colors by one extremely bad Arkansas traffic Saturday in the fall of 2004. Now to the code. First, we’ll load in all the data from the NHTSA (available at ftp.nhtsa.dot.gov/fars/). Because the files added data points over time, we’ll need to select just what we need for the visualization so we can combine them all. Now, we need to create empty entries for those dates that don’t have any fatal wrecks (not necessary for nationwide plots, but necessary for Arkansas-specific ones). We’ll add this to the data we created earlier. Next, we’ll create some additional columns to give us the week of the year, which is how we plot the bands. This code is adapted from the very helpful r-bloggers post I mentioned in the last visualization post. As an aside, if you’re interested in data visualization, you should subscribe to r-bloggers, as those guys are always posting fascinating stuff. Next, we’ll look at the maximum and minimum number of fatalities across the three sets of data we’ll be plotting. This will allow us to keep the same scale across all three plots. We’re finally done with our data processing. The next step is to set up a theme for the visualization. To do this, I installed the development version of ggplot2 from github to use some of the newer features like subtitles and moving the facets (year labels) around. I hope you found these visualizations useful. I’d love your feedback on what you insight you gathered from the visualizations, or any critiques on how to make them more useful. I’m new to R, so if you’re seeing these and have suggestions for how to do things more efficiently, I’d love to see you comment.